Biotin, a 244 Dalton vitamin (Vitamin H) molecule, exhibits an extraordinary binding affinity for avidin (Ka=1015 M-1) and streptavidin. Biotin and avidin interaction is rapid and once the bond is established it can survive up to 3M guanidine-hydrochloride and extremes of pH. Biotin-avidin bonds can only be reversed by denaturing the avidin protein molecule with 8M guanidine-hydrochloride at pH1.5 or by autoclaving. The biotinylated molecules are efficiently probed with avidin or streptavidin conjugated to reporter molecules, such as peroxidases or phosphatases. The use of biotin for non-radioactive labeling of proteins and nucleic acids has now become an increasingly popular technique in life science research. The use of biotin conjugation has eliminated the hazards, instability, and disposal problems associated with the use of radioisotopes. Avidin is a glycoprotein with approximately 10% of its total mass coming from carbohydrates. 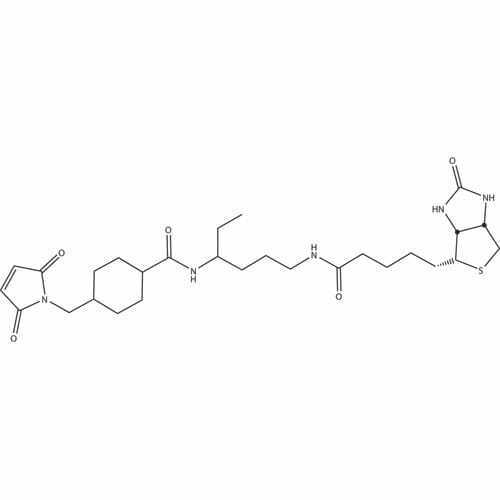 Avidin has a molecular weight of 67kDa and contains four identical 128 amino acid subunits that each have a single biotin binding domain. 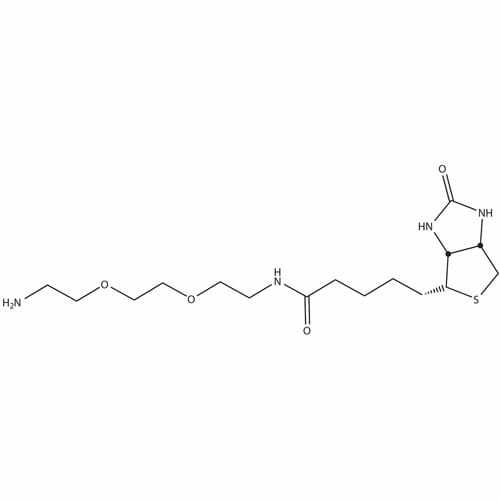 Avidin is a basic protein with an isoelectric pH of 10-10.5 and is readily soluble in aqueous buffers containing a wide range of salt, pH, temperature and other laboratory agents. 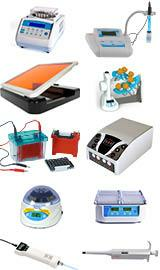 This wide range of tolerance makes avidin suitable for a wide variety of analytical applications. 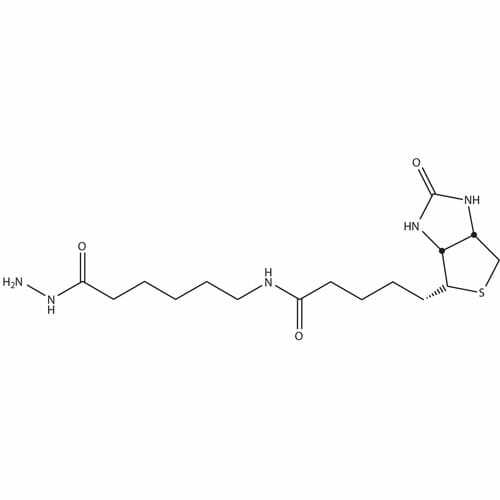 Streptavidin is a tetrameric protein and in many respects is similar to avidin except that it has no carbohydrate and has a slightly lower molecular weight of about 60kDa. 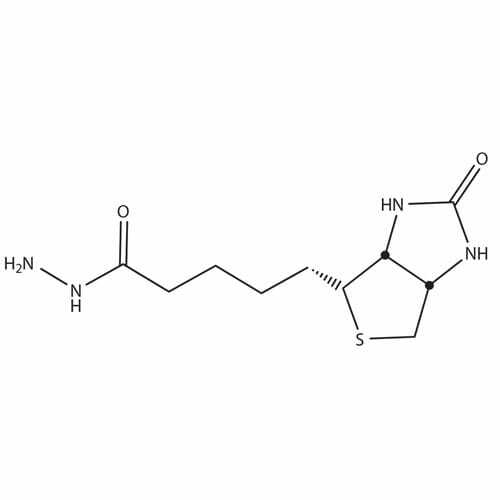 The solubility of streptavidin (isoelectric pH5) in aqueous buffer is much lower than avidin, but the binding of streptavidin to biotin is similar to that of avidin. Several factors must be considered when coupling a biotin reagent to a protein to ensure a successful reaction. The primary consideration is the selection of the biotinylation reagent itself. A wide range of biotin reagents are offered that have variations in their reactive groups, spacer arm lengths, solubility, membrane permeability and reversibility. All these factors must be considered and are dependent on your protein/peptide. The HOOK™ Biotin Reagents offered have numerous reactive groups that can couple to primary and secondary amines, sulfhydryls, carboxyls and carbohydrates. Conjugation of biotin reagents to proteins and other molecules generally does not have adverse effects on the biological properties of the target molecules, unless biotin reagents are conjugating to or modifying active residues or sites of the protein. Due to this, it is important to find an appropriate biotin reagent and optimal biotin conjugation efficiency for maintaining the functional properties of the target molecules. The conjugation efficiency of the reactions is dependent on the reaction groups and the buffers used for the reactions as many coupling reactions are sensitive to pH and chemical composition. The following section highlights the key features of the coupling reactions and important buffer information. Based on the target reactive groups, biotin reagents can be divided into amine reactive, sulfhydryl reactive, carbohydrate reactive, and carboxyl reactive. Photoreactive biotin reagents react non-specifically upon exposure to UV light and are used when no appropriate reactive target is available on the molecules. There are reversible or cleavable biotin reagents that allow selective elution of the biotinylated molecules. The wide variety of biotin reagents makes it possible to select an appropriate biotin reagent for a particular application. G-Biosciences' researchers have carried out extensive studies into the above reactions and have designed six Optimizer Buffers™ that have the ideal conditions for each biotin reagent. Each HOOK™ Kit is supplied with the correct Optimizer Buffer™. Simply exchange your buffer with the Optimizer Buffer™ and proceed with the reaction. Each kit is supplied with a convenient micro dialysis system for buffer exchange and removal of unbound biotin. 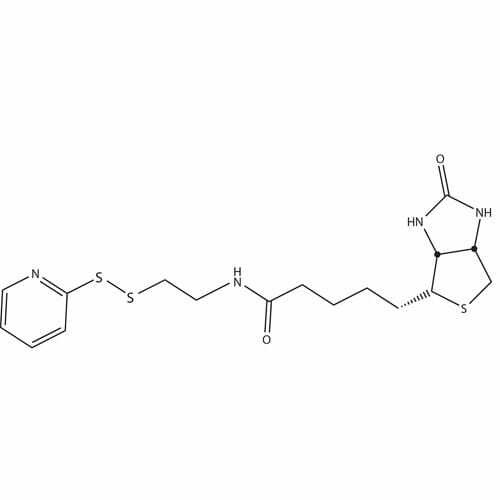 The biotin-binding domain in avidin/ streptavidin molecules are buried 9Å below the surface and hence, the presence of bulky groups in the vicinity of the biotin-binding site may create steric hindrances and reduce the binding efficiency and the sensitivity of detection methods. Greater binding capacity and higher detection sensitivity can be realized by using biotin derivatives that have large spacer arms attached. 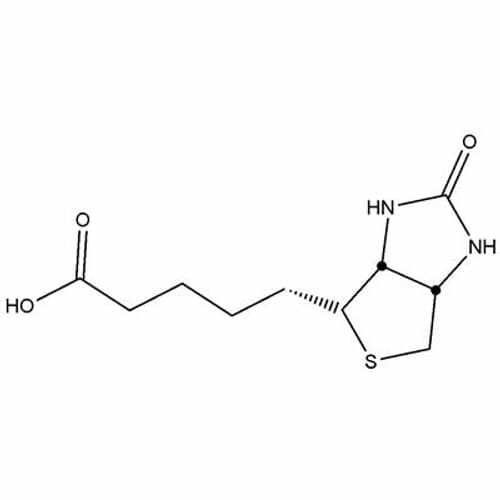 Extended spacer arms afford the biotin molecule the ability to overcome steric hindrances and bind deep within the binding sites of the avidin/ streptavidin molecules. The solubility of the HOOK™-Biotin Reagents varies greatly, with some being only soluble in organic solvents, such as DMSO and DMF. The Selection Guide highlights the solubility of the reagents. Membrane permeability has become of great interest in studies of cell surface proteins and therefore membrane trafficking and cell signaling. The HOOK™ Biotin Reagents that are not membrane permeable are excellent candidates for labeling membrane surface proteins, with HOOK™-sulfo-NHS-Biotin, HOOK™-sulfo-NHS-LC-Biotin and HOOK™-sulfo-NHS-SS-Biotin being the most popular. 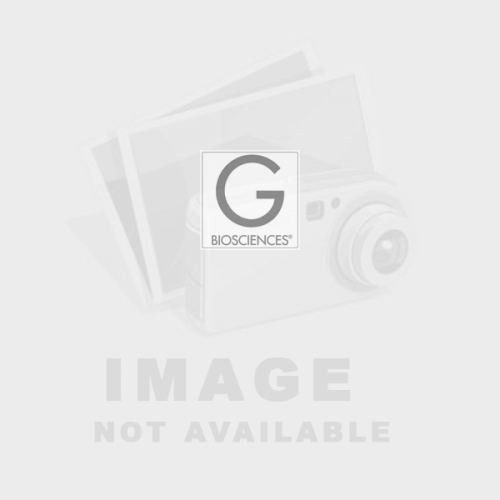 Biotin tags are often used for protein purification, however with the biotin:avidin binding affinity being one of the strongest known it is often difficult to release the protein from the avidin. In fact, 8M guanidine at pH1.5 is often used, which has severe detrimental effects on the protein of interest. Several HOOK™ Biotin Reagents have disulfide bonds that can be reduced to release the protein of interest under mild conditions and other HOOK™ Biotin Reagents can be removed from the protein with changes in pH. Reactive Group: Determines the location of the biotin moiety, select a reagent that does not interfere with protein's function. Membrane Permeability: For cell surface labeling select non-membrane permeable reagents. Cleavable: For easy removal from immobilized avidin or streptavidin during purification select a reagent with a disulfide bond. Reversible: An alternative to cleavable reagents are reversible reagents. NHS-Iminobiotin is released at low pH. Steric Hindrance: Bulky groups around the binding site may require reagents with longer spacer arms. Avidin is a glycoprotein with approximately 10% of its total mass comes from carbohydrates. 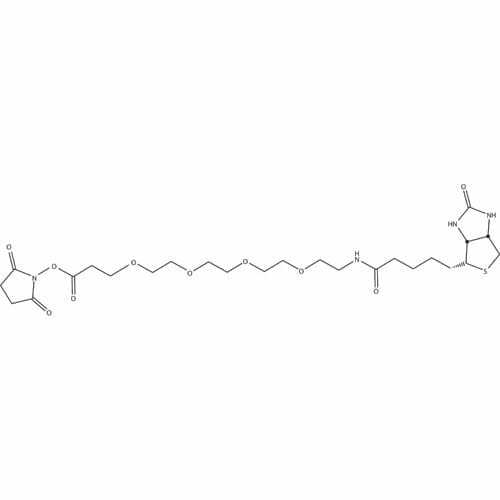 Avidin has a molecular weight of 67kDa and contains four identical 128 amino acid subunits that each have a single biotin binding domain. 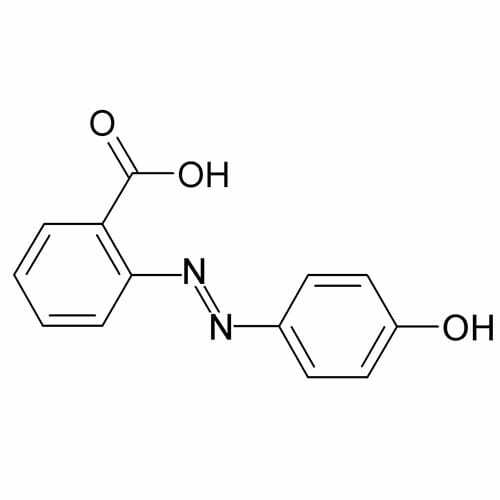 Avidin is a basic protein with an isoelectric pH of 10-10.5 and is rea..
HOOK™ BiotinQuant™ uses HABA (2-(4-Hydroxyphenylazo)benzoic acid/ 2-(4′-Hydroxybenzeneazo)benzoic acid/ 4′-Hydroxyazobenzene-2-carboxylic acid) to rapidly estimate the mole-to-mole ratio of biotin to antibody or protein. The method of biotin incorporation estimation ..
HOOK™ Cell Surface Protein Isolation kit uses G-Biosciences HOOK™ biotin labeling and purification technology in conjunction with our Mammalian Cell PE LB™ lysis buffer to conveniently label cell surface proteins and isolate them for further analysis, including Western blotting. &.. 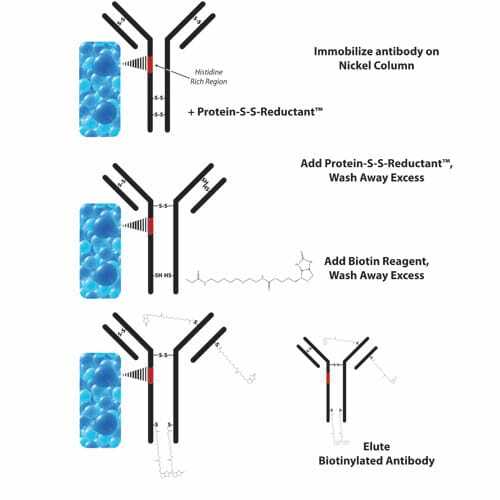 Simple Antibody Biotinylation The HOOK™ IgG Biotinylation (Sulfhydryl) kit is designed for the efficient biotinylation of IgG molecules by immobilizing the IgG molecules on a solid support (Figure 1). 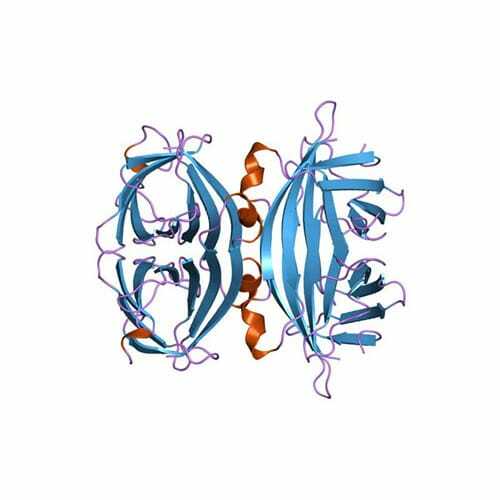 IgG molecules contain a histidine rich region in their Fc region and ..
HOOK™ NHS-dPEG™4-Biotin reacts with protein primary amines. Amines, lysine ε-amines and N-terminal α-amines, are the most abundant group in protein molecules and represent the most common target for biotinylation. For example, BSA contains 59 primary amines, of which ..
HOOK™ Biotin-BMMCC reacts with protein free sulhydryl groups. Sulfhydryl reactive reagents are more specific and react only with free sulfhydryl residues (-SH or thiol groups). The side chain of the amino acid cysteine is the most common source of free sulfhydryl groups. If free sulfhydryl res.. 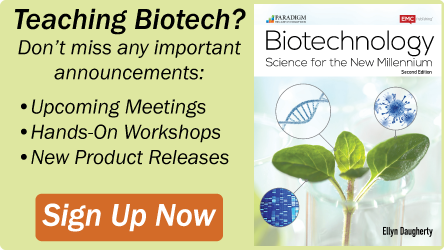 The use of biotin for non-radioactive labeling of proteins and nucleic acids has now become an increasingly popular technique in life science research. Several factors must be considered when coupling a biotin reagent to a protein to ensure a successful reaction. The primary consideration is the sel..
HOOK™ Biotin-PDA reacts with protein free sulhydryl groups. Sulfhydryl reactive reagents are more specific and react only with free sulfhydryl residues (-SH or thiol groups). The side chain of the amino acid cysteine is the most common source of free sulfhydryl groups. If free sulfhydryl resid.. The use of biotin for non-radioactive labeling of proteins and nucleic acids has become an increasingly popular technique in life science research. Several factors must be considered when coupling a biotin reagent to a protein in order to ensure a successful reaction. The primary considera..